"Something that makes Martin famous is when he said one day 'I'm going to turn this world upside down.' He did do what he said." 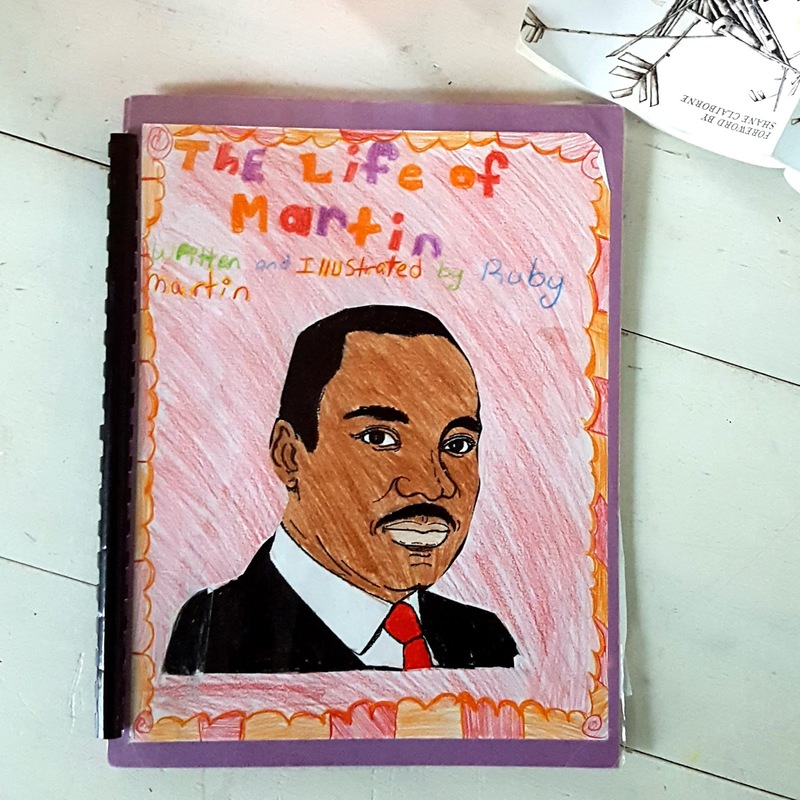 This is the opening line of Ruby's biography about Martin Luther King, Jr., one crafted last year over months of intense learning about his life and legacy. From her telling, he used to play pranks on people when he was a child. He took piano lessons. He became "a good speaker". He was kind. A pastor. "He worked for peace." "So, how did Martin help inspire others? Well, he inspired a lot of people. He inspired his church and his family. He even inspired white people." He even inspired people like me, people like the young author's mom and dad. When a third-grader finds the word "even" necessary, we have found ourselves staring at a gaping wound. We have found ourselves with bloody hands. Sometimes I'm asked how we came to adopt our four children and I laugh. "We didn't know we had to choose a country!" I say of our first adoption. "We didn't care where our child came from." This is true, and I'm not sure whether or not I should be embarrassed. Thirteen years ago, I was a different person, alive and well under the protection of my uniform, tidy bubble. I had a few Asian friends, a few black friends, one friend who told me as we folded jeans into crisp thirds for the denim wall, "When I was adopted, my parents didn't know if I was Hispanic or Native American, so they gave me a name for both." Ill-prepared as we were, our babies found their way to us, scarred by loss, tender and tough. They were wiser than I. Braver than I. We loved them immediately, protected them fiercely. But we didn't yet know about 2014. We didn't know the ways it would rock us, or how each successive year would only get more difficult. We believed our love was enough, but how could it be? Is it really love when it's veiled in willful ignorance? Is it really love when it only costs us small things, like laying old dreams to rest and thirty thousand dollars cash? They reminded me of the young man fused to the inside wall of my heart, the one who had lived in my basement and called me "mom" from a crackling landline, then at Subway on his first day home, then a thousand times since. He was the one who made it impossible to wave away the true state of things, all muscle and height banging around in my kitchen, wrecking up my pans, ruining my soul for the way things used to be. He was the one who whispered that one brutal night, "I honestly don't know how I let this happen." He wasn't referring to his time spent in jail, but to his dad and I sitting there by his bed with wet cheeks and weary hearts. What lapse in judgment had caused him to make room for us? His adoption had cost him things. He'd had to let some old dreams die, this I know. But he'd also had to open himself up to a new direction of growth. Nothing feels more impossible than real love, it seems, not when the cheap stuff sits there in its pretty bottle, sanitized and safe. One of my favorite high school teachers used to say, "Perception is real to the perceiver." I scribbled it into my notebook, but I didn't claim to understand. To me, there existed no line between reality and perception. I had been indoctrinated to "truth", both intentionally and by the sheer inertia of the life which chose me. Then, the world only existed within the frame of my experience. Everything else was peripheral. I defined the issues. I derided immigrants who did not know "our" language. I was taught one narrative, force-fed a casserole of political conservatism and boot-straps theology with just enough cheese to make it difficult to distinguish one from another. I was taught there were good guys and bad guys, and I was good. I was right. Only today did I learn that the revered President Reagan himself actively opposed the work of MLK and resisted voting for a national holiday in his name. How could I have known, after generations of status quo? Who would have dared confront the complexity of this fact? I didn't even have to be color blind. Being just plain blind worked fine. Of course, the men and the boys, they had always been dying. But we can't know what we don't see. I'm not proud that I didn't reach a solid awareness of the trouble continually dealt to people of color until I had a front row seat. This is far too great a burden for any child to bear, never mind that the "child" is legally a man, never mind that he's a willing teacher. The thing about waking up is that our eyes were conditioned for dimly lit places. It will be uncomfortable, maybe forever. It will be unpopular, maybe forever. But it will move inside, this awakening, at the speed of biology. Cells dividing, truth conquering lies, taking up space, overcoming what must die in its place. We spent hours driving soggy, foggy highways today. I know better than to read while the van is moving, yet I couldn't look away. I have come to understand that my views don't necessarily fit well within the puzzle of my place. It's impossible to ignore. Sometime last year, I made the conscious decision to begin listening to and learning from People of Color and others pushed out of the white, privileged, mostly-evangelical bubble where I spent most of life and where, in many ways, I remain. Twitter makes this particularly easy, and I urge you to start following folks who espouse views which stretch you. Today, as most days, my feed was wholly woke. I read about action and protest. I read tweet after tweet of MLK's quotes. I considered again the difference between praying for justice and fighting for it. Facebook was an entirely different situation. There, folks were largely interested in, well, everything else. Food, work, television, exercise, bullet journaling, kids, rants, pets. Typical Facebook fare. I get it. Life is still life, and even I started my day by publicly musing on the weather. This certainly doesn't indicate racism. But it might indicate a lack of awareness. It might be a flashing sign that we have not widened our circle enough. As we begin to look hard at hard things, as we begin to know new perspectives, it becomes impossible not to care. I felt, perhaps for the first time, that if people don't care about today, then they don't care about my family. Admittedly, this isn't fair. It would be dangerous to conflate our social media commentary with the full contents of our heart. I care about many things on which I don't publicly comment. More importantly, I care about people affected by a wide variety of things of which I am not and never will be personally affected. But I am just barely tasting the difficulty of raising children to value all of humanity in a world that, for example, does not see the point in celebrating a man who helped shaped the narrative of two of my kids, three of my nephews, all of my grandkids, and countless friends and neighbors. It's hard to hear that this is not reason enough to miss school, that the parade was canceled this year, and oh, what a drag that the mail isn't running. What an impossible inconvenience. It's hard to not to feel frustrated. It's doubly hard to acknowledge that this is not a single lick about me. I cannot be the reason I or you care. There are millions of other reasons, we simply need to know them, and then to love them. Here I am, at the tail-end of this dripping wet holiday, just barely beginning to consider the ripples of Dr. King from my safely removed vantage point. Meanwhile, my daughter is on a first name basis with this man whose tide she was swept into at the tender age of nine. The wonderful news is, it is not too late to make some noise. We can choose, as Dr. Martin Luther King wrote, to root out injustice by "a strong, persistent and determined action." Unpopular as it may be, you can be the one to apply some pressure to your apathetic school system or your ranting Uncle Phil. You can task yourself with learning more, teaching your kids more, in the hopes that next year, you'll feel this day a bit differently. Scrolling through my social media accounts today left me with a pang in my gut, not because I'm mad at everyone, not because I think myself any better, but because it's impossible not to wonder how much undue damage I inflicted over the years with the weight of my own silence. I have so much to repent of and so much to learn. But if I know one tiny little thing, it's that I have a voice, and though it's wobbly and uncertain, it wields real power. I can only pray that at the end of my long life here on earth, I'm hoarse from shouting on behalf of whomever is found at the short end of power and dignity. Thank you for sharing! Love you Ruby's heart and this was a good reminder for me to stay awake, to keep my eyes open. Thank you for speaking these things out. Also, have you read "The Warmth of Other Suns?" I picked it up a few years back at my parents house and was really intrigued but didn't finish it. I haven't read that one but I NEED to! I've heard so many good/hard things. Thanks, Erin! I read this and then took a deep, long breath. Thank you again, Shannan, for figuring out how to put into words the impossible. For your reading list, I started Nobody by Marc Lamont Hill this weekend and cried through the entire first chapter. I'm not aware of "Nobody", so I thank you for letting me know! I'll be sure to find it. This is beautifully written, friend. Thankful for you. Great post! Have you watched 13th? Its available on Netflix and Bryan Stevenson and Michelle Alexander are both interviewed in it. Very informative, I learned so much. Next on my read list is "America's Original Sin-Racism, White Privilege and the Bridge to a New America"
friend, this had me in tears. If I could, I'd underline all of it. The "even", the perception, the embarrassment, my blindness, what it took for me to start to see, how it's not about me but oh how I love dearly the people it does concern...figuring out my views and using my tiny voice...thanks again for your honesty and sharing your heart. Thank you for writing this. I too feel frustrated, and, as a result, I did post anything on social media yesterday. It felt so cliche to on this one day care. But, then I wondered if my silence was signal I didn't care. We should be caring everyday, people! Everyday I struggle because I am a white middle class woman and how do I fight for the rights of others without trying to be a savior. And, will my actions be interpreted as someone who really doesn't understand the problems. :( This just made me cry. Deep, deep tears. Your posts almost always do that though. Thank-you for waking us up with your words. I once did a program for kindergarteners using Fisher-Price people entitled "Kind of the same but kind of different." I help up pairs of toy people and we talked about how they might have the same clothes but different hair, the same color hair but different styles, etc. Then I asked the kids to hold out their hands and look at them, did the all have the same number of fingers? They all said, "Yes." Then I asked if that made them kind of the same and everyone of the black kids said, "No." I wanted to cry. I don't even know where to start...but the flow and power behind your words was something much bigger than just you. Thank you for this. I have so, so much to learn. I just reread Between the World And Me - which I believe should be required reading for every white person on the planet. And I cried when I read his descriptions of the "white" when I think about the direction this country is heading under Trump .And I have tried, from my white-privileged urban existence, to speak to "Christians" supporting him, to have an exchange of ideas with them rooted in Jesus' words - and have been harshly rebuked for the most part. I love this post, thank you for sharing. Thanks for reposting this! I somehow missed it a couple of years ago. Thanks for helping open my eyes again and again. You posted something on Twitter yesterday that exposed yet another layer of my ignorance....I don't really know whether to be ashamed or grateful for it.